Do you want to organize a reunion, study day or a multiple day’s seminar? Our location with the exceptional view on the island of Bréhat, will be an ideal place to combine work, team spirit and relaxation. Conference room on the ground floor with sea and wooden terrace view. Capacity: 10 – 14 persons. 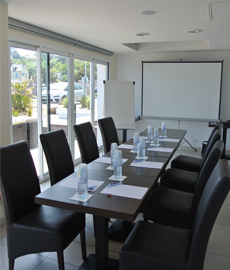 Large conference room on the ground floor with a view at the island of Bréhat. Conference room with a glass roof, a private terrace and sea view. Free Wifi, overhead projector, paperboard, computer, dvd player, flat screen TV, printer, fax, photocopier and Business center. A business lunch for 20,00€, a seafood platter for 45,00€ or more sophisticated menus, our team is here to satisfy your wishes. 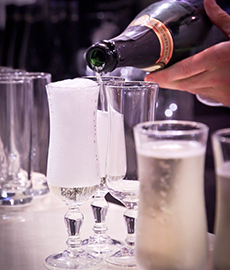 We can also organize buffets, cocktails or “aperitif dînatoire”.